The 2010 team consisted of 35 persons including P. M. Fischer (director), R. Feldbacher (assistant field director), H. Ta’ani (foreman, trench master), M. Al-Bataineh (surveyor, draughtsperson). Other trench masters were J. Azzopardi, D. Blattner, T. Bürge, L. Franz, A. Gustafsson, N. Monschein, M. Pehrson and P. Täuber. Assistant trench masters were I. Fischer, L. Längström, R. Lundh, S. Lundh, J. Martinell, S. Martinell, L. Nyström and M. Werngren. The representative of the Department of Antiquities was Mohammed Es-Shalabi. The expedition was further backed up by the Director General of the Department of Antiquities of Jordan, Dr. AlSaad Ziad, and the inspector of Pella, Nasser Khasawneh. Additional support was provided by Samir Esbeihat (cook), Deeb Jawahreh (pottery washing) and Musa Mohammed Ahmad (transport). 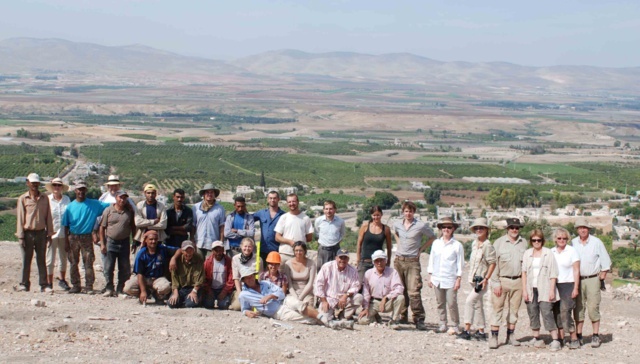 Ten local workers from Pella, Mashare´a and Yabis were engaged in the excavations. The 2010 team. Photo taken from the western slope of the upper plateau of Tell Abu al-Kharaz. Jordan Valley in the background. The architectural remains of this phase, most of them visible on the surface or just below a thin layer of colluvial soil, were badly preserved due to their superficial positions. Only the northern part of this compound provided some interpretable structures. The western structure is fairly well-preserved, viz. approx. 11 m (east-west) x 5 m (north-south) in size. A 4 m wide gate (?) separates the former from the eastern structure, of which very little is preserved. The function of these two buildings is difficult to assess. Nevertheless, the large dimension of the western structure and its closeness to the summit of the tell makes it likely that it had an administrative function. The 4 m wide opening between the two buildings may point to a portion of the city gate.The majority of the sherds are from the second part of the Iron Age but a few intrusive sherds dating to the late Roman/Byzantine and Abbasid periods were also found. There are no other finds of significance except for a typical Iron Age loom weight of unfired clay. The exposed compound is at least 22 m wide (east-west) and 8 m long (north-south) and contains nine walled spaces. They are bordered to the south by the array of city walls from earlier periods which were reused as foundations for new structures. Whereas the structures of the western part were in use unchanged throughout Stratum 1B, the structures of the eastern part point to two sub-phases. In the west is the largest walled space, viz. 6 m x 5 m large. It is most likely a courtyard which was partly stone-paved. On the floor is a substantial layer of burned debris and ash. Finds from the floor level and the fill above it include a black juglet, a plain, ceramic spindle whorls and an arrowhead of bronze. There is also a part of a basalt bowl and a partly preserved bronze handle of a sword (or a large dagger). The next eight spaces, again covered by debris and ash, are smaller and of varying dimensions, roughly from 2-3 m x 2 m. Two central spaces are partly stone-paved, the southern one of which is disturbed by a sewer. The sewer dates to the Abbasid period and functioned as a drain for rainwater from higher up the tell leading the water outside the city through the array of city walls from earlier periods. Large pieces of a black jar with the typical white Abbasid decoration were found embedded into thesewer. The central rooms contained numerous pieces of leather-hard, unfired vessels, mainly larger vessels, which proves local production of pottery. The northern of the next pair of rooms to the east revealed quite a large, roughly circular, installation which is most likely a kiln for firing pottery. Opposite the kiln is a clay bench and south of it a small fireplace built of mudbricks. 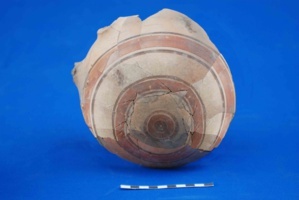 Amongst the finds is a decorated jar with a pattern encircling the entire shoulder. The pattern on the shoulder of the decorated jar gives the impression that the potter tried to imitate a script. 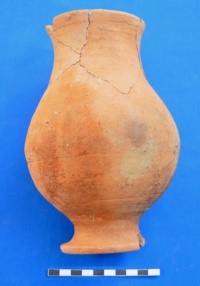 However, no interpretation is possible (yet) and it may be the case that an illiterate potter tried to imitate signs because it is difficult to see it just as a decoration: the jar is totally different from other similar vessels on which the decorations are much more accurately executed. The older sub-phase is conspicuous in the eastern four rooms where in one of the northern rooms two tawabeen preceded the kiln. There are also installations of clay and a millstone, all of which point to the preparation of food. Finds from these eight spaces are quite scarce, which confirms that the people resettling in the later part of Iron Age “cleaned” the area or that the area was looted after the conflagration and a probable attack: it is obvious from the thick layer of debris and the ash that Stratum 1B suffered from a severe catastrophe. Iron Age I: overview from the east. Jordan Valley in background. In the second half of the period of our excavation we reached the stratum which corresponds to the partially exposed building from the excavations in 2009, which was so rewarding in its state of preservation and the numerous finds it yielded (see website Season 2009). After removing debris with a total thickness of almost 1 m and the burnt down roof constructions which were up to 0.5 m thick we were able to expose a compound of a total of approx. 28 m in the east-west direction and 8 m in the north-south direction (2009 and 2010 season of excavations). The compound consists of seven pairs of rooms, which gives a strong impression of centrally supervised town planning. The 14 rooms are fairly standardized, viz. they are from 2.5 m x 3 m to 3 m x 3 m in size. The walls of the compound are in general 0.6-0.7 m wide except for one of the city walls, which is approx. 1 m wide and against which the compound is built to the south. All seven pairs of rooms are connected to each other through standardized entrances which are 0.6 m wide. These entrances are always from the east, except for the most western pair of rooms which had the entrance from the west. All rooms were plastered on the interior with a layer of fine clay. 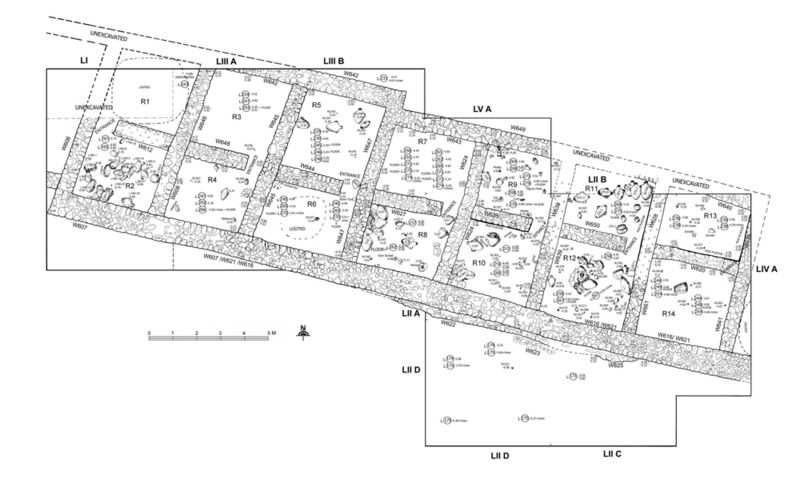 Plan of Iron Age I occupation, Stratum 1C. The floor contexts of the 12 undisturbed rooms are amongst the most rewarding of all so far excavated during the last 20 years. Most of the rooms were crowded with pottery and other finds in undisturbed primary contexts. More than 100 complete vessels, locally produced but also imported, were found. 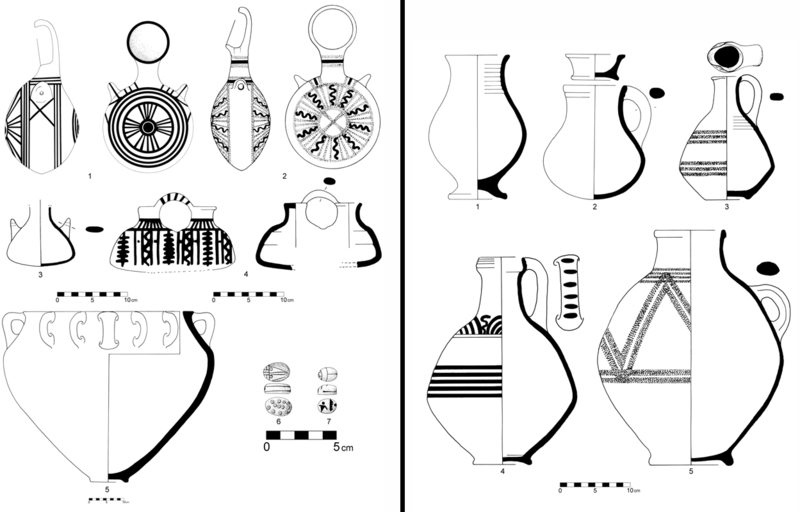 Bowls, goblets, kraters, juglets, jugs, lamps, pilgrim flasks, alabastra/pyxides (one of alabaster/calcite, and one as a double vessel with basket handle), storage jars, cooking pots of the typical early Iron Age types with triangular rims, and mortars, spindle whorls and basalt pestles are amongst the finds. 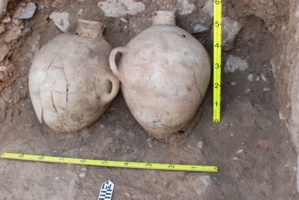 Iron Age I (Phase 1C): two primary contexts. Iron Age I (Phase 1C): Phoenician import. 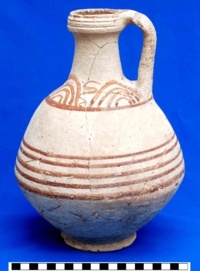 Amongst the imports is a large Phoenician jug which is of excellent craftsmanship with bichrome decoration on a burnished red background. Iron Age I (Phase 1C): large "goblet"
There is also a room with a still upright stand/incense burner with a lid in the shape of a chalice. Another room was also packed with finds. 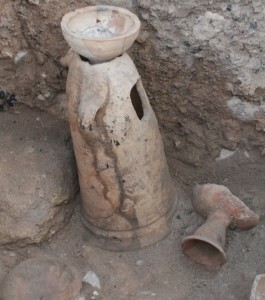 In the south-western corner of this room were storage jars leaning against the walls, kraters, pilgrim flasks, a pyxis, a double-pyxis with a connecting handle and various juglets, lamps, one of which is four-spouted and a variety of tools of stone. 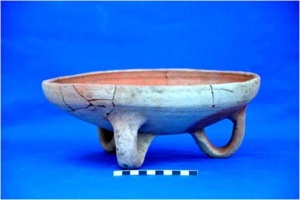 There are a number of vessels which were imported: amongst the Philistine-type vessels is a large, shallow, white-slipped and burnished bowl standing on three loop handles, and the second one is a monochrome-decorated, large jug with a thick white, burnished, slip. 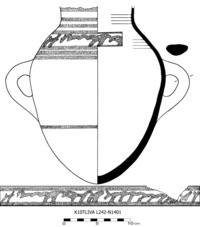 Iron Age I (Phase 1C): Aegean/Philistine-style jug. Other rooms also contained a multitude of objects, a number of them imported. 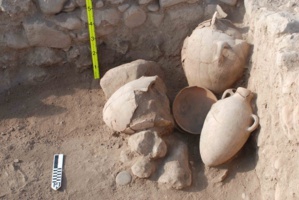 Several storage jars, jugs, juglets and cooking pots, chalices and two large “goblets”. Other finds include a scaraboid of steatite with the stylised representation of the head of a horse insteadof the common representation of the beetle’s pronotum and the wings, and with drilled circular decorations on the base. Another find is a scarab of paste with the possible throne name of Tuthmosis III. One of the small vessels is of alabaster, calcite in the shape of a pyxis. One of the most easterly rooms is remarkably well-preserved: its well-constructed walls are still upright to a height of almost 2.5 m.
Iron Age I (Phase 1C): Room 13 during excavation with 2.5 m high walls preserved. 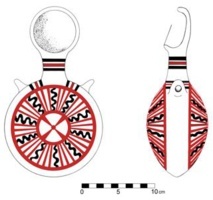 Iorn Age I (Phase 1C): "horse head" scaraboid (left); scarab with Tuthmosis III'(?) throne name (right). Ten samples for radiocarbon dating were collected from Stratum 1C from the excavations in 2009 and 2010. The first set of four samples (2009) contains one outlier (Middle Bronze Age) but the remaining three are all from 1200 to 1000 BCE (2σ), or roughly 1130 to 1000 BCE (1σ). The next set of six samples (2010) is in same range as the previously dated. Guarding of the site has been granted by the Department of Antiquities, which will facilitate the continuation of the project. 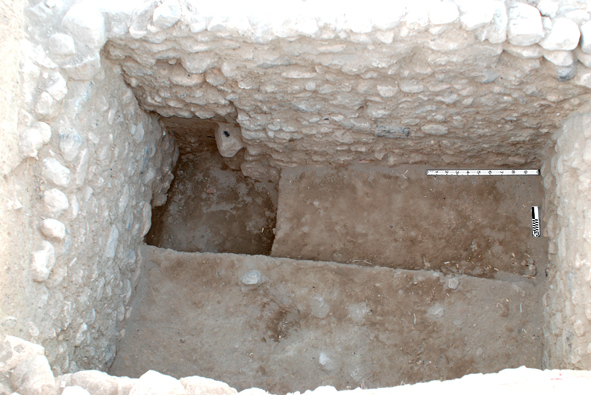 Consolidation of the well-preserved architectural remains of the Early Iron Age remains has been done. Extension of the opened area from 2009 and 2010 towards the north, viz. to the centre of the city, are objectives for the coming seasons in order to further investigate the very rewarding remains from Early Iron Age occupation. 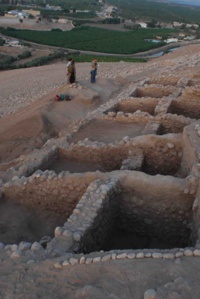 Thanks to a generous grant from the Shelby White-Leon Levy Program the results from Iron Age remains excavated 1989-1998 will be published in: “Tell Abu al-Kharaz in the Jordan Valley. Vol. III: The Iron Age”. It is the ambition of the project director to add the new results to the volume.